Later in the term the children visited the fire station. This was a fantastic opportunity for the children to find out about the roles of firemen and about the equipment used etc. The children got to handle some of the equipment used by the Fire Service like the jaws of life and the thermal imaging camera. It was an exceptionally hot day and the firefights were kind enough to help us cool down with their hose! This term, the children have attended swimming lessons at Penyrheol Swimming Pool and they are all showing increased confidence in the water as a result. They also participated in drowning prevention week and they have now learnt how to be safe around water this Summer. We have been fortunate also to receive a visit from the police. We are very grateful to PC Hinds and the local PCSO for visiting and talking about their role in the community. They showed the children their uniform and the equipment used. They then answered a number of the children’s questions. 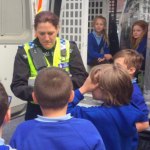 The highlight of the visit was when the children got a chance to sit inside the back of a police van!